Kickstart the online business with the templates which focus on boosting the eCommerce aspects as these would bring in revenue and act as the profit indicators. Catchy designs have been duly welcomed by the customers as they prefer the professional layout and revisit the websites for shopping. VirtueMart Wedding templates can thus be of great use to the wedding planners with better sales and profitability in the picture. 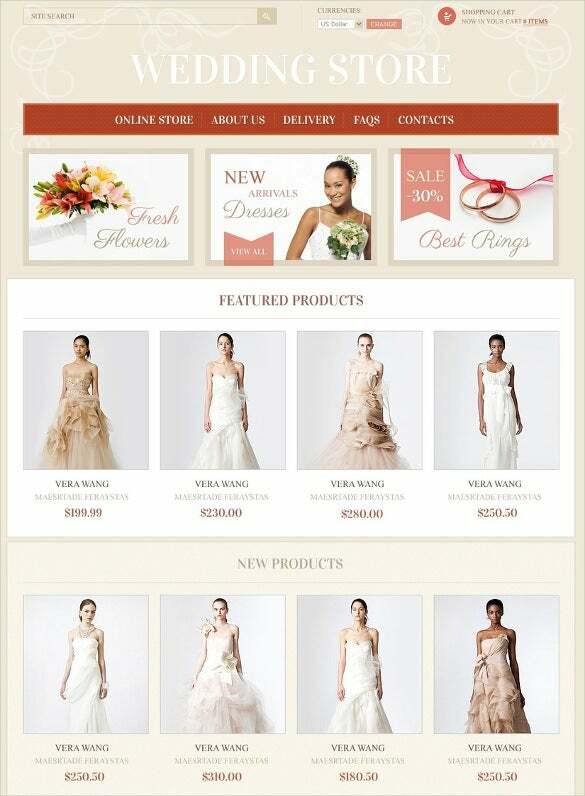 This wedding store template looks neat and smart. It starts with a huge banner advertising your bestsellers. It is followed by sections on your latest arrivals as well as special offers. 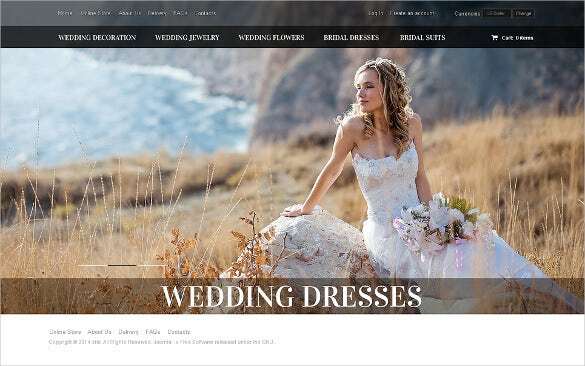 This responsive wedding shop template opens up on an elegant note where you have a gorgeous bride posing on a rock in a ravishing gown. 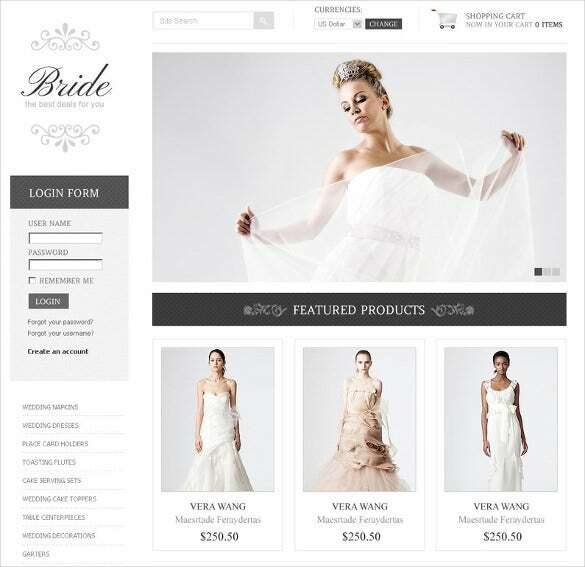 The template will allow you to list different wedding fashion products like dresses, shoes, jewelry etc. This classy wedding store template comes up with sections on new arrivals, discount offers, latest arrivals and featured products. The combination of beige & white with ochre accents is just appealing. This is a very practical wedding dress store where you have huge banner to feature your special products. The page also contains direct links to currencies, shopping cart and product categories. This is a very elegant wedding card store theme which starts with a welcome note. It is followed by some of your major products along with pictures. The homepage contains direct link to shopping cart and search bar. Templates can be downloaded and installed by the professionals as the forging eCommerce tools whereas certain premium options provide strengthened payment gateways, thus simplifying the entire process considerably. Best available features include multiple module positions which act as the perfect allies for bettering the entire eCommerce performance. The templates are easy to customize and the stylish designs do attract a number of customers. Separate sections for jewelries and apparels are available with these templates which focus on a congregated shopping approach.Customizable color palette and sub- pages are up for grabs besides the simplistic professional layout. Certain top rated features which separate these templates from the rest of the herd are PSD files and SEO optimization. Cross browser compatibility is seen with many templates and the configurable customer pages do justify their selection.